This snorkel adventure takes you from Paradise Island out to the beautiful and pristine coral reefs aboard one of our awesome and spacious catamarans. This is the way to experience Nassau Harbor from the same vantage point as one of the many maritime adventurers who have passed through this Caribbean port such as the self-proclaimed King of the Pirates, Henry Morgan, and the infamous pirate known as William Teach, better known as Blackbeard. By joining us on this trip, you can feel the sea breeze blow through your hair as you ride upon our fantastic catamaran. Once on the coral reef, you will get the chance to explore the amazing array of animal and plant wildlife that make the reef their home. You'll be amazed at the kaleidoscope of colors and species including sponges, undulating sea whips, jagged elkhorn coral, and bulbous brain coral. You will likely even spot one of the various sea turtles such as the hawksbill turtle, the green turtle, and the loggerhead turtle. This is an expedition for the entire family! Children will never forget their experience of getting such a personal and up-front view of this thriving marine environment. This tour will be an excellent opportunity for children to learn about the complex biological world that is found underneath the sea's surface. 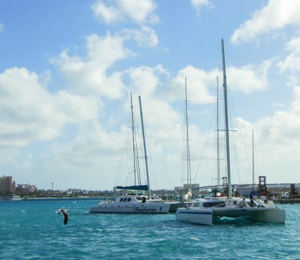 These trips are sure to be the highlight of any Bahamian vacation!